Since I have three boys, I rarely get to play with lots of girly scrapbooking papers. You know, the ones that I really, truly love! I decided to make a card for DCWV's sketch challenge that totally was my style, not for anyone else. 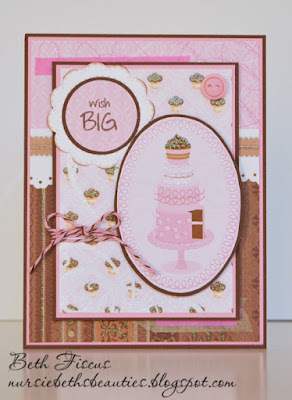 I used DCWV's 8"x8"Sweet stack for this card. It is full of glitter and lots of PINK (my favorite color)! I also have always loved the color combo of pink and brown, which this paper fits as well. Talk about a win-win situation all around! I felt this paper was very fitting for a birthday card, so that is the theme I went with. The rectangle layer and the oval layer are popped up with foam tape. For the finishing touch, I wrapped Chocolate Cupcake Trendy Twine around it and tied it in a bow. I love how this card turned out. Even though I didn't make it with any recipient in mind, I had so much fun making it. Sometimes projects like this are the best form of crafting! Love all the sweet goodness! Totally cute Beth! Beautifully love your design! Thanks for joining the Pink and Main birthday challenge! DT Member Pam M.
I love all the pink!! Thanks so much for joining us for the Pink & Main birthday challenge! Die Cuttin Diva's GDT Happy Halloween!